A newlywed couple have claimed their big day was ruined when a man burst inside the church shouting 'Allahu Akbar' and then started tearing down wedding decorations. 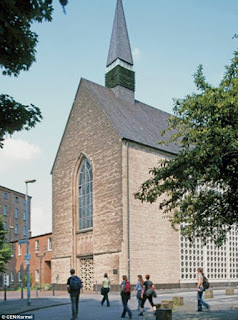 Groom Marcel Lohbeck, 35, and bride Friederike were celebrating their wedding with 90 guests in the Karmel Church in Duisburg, a city in western Germany. Lochbeck said: 'At the beginning of the ceremony, a man with a thick jumper and a hat on came into the church and sat in the back row. 'Shortly afterwards, he stood up and wandered around the candles. He laughed in a disturbing manner and then fondled the statue of Mary. Police officer Ludger A., 57, the uncle of the groom, reportedly tried to intervene along with the church sexton. After the man again refused to leave the church, there was a fight in which the police officer got slight injuries to his face. Yet he managed to restrain the man until his colleagues from the Duisburg police could arrive. After a medical examination, the 23-year-old Syrian man was taken to a psychiatric hospital.